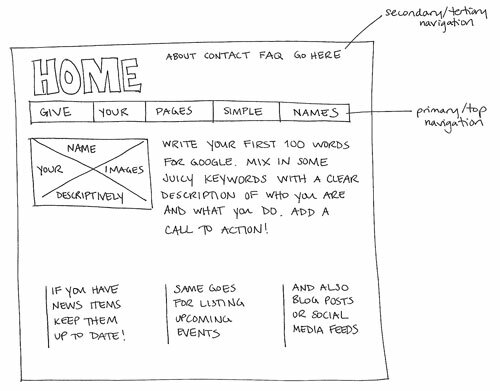 Google will index the first 100 words of your home page. So, start with a catchy, descriptive headline. Then compose a keyword-rich paragraph describing you who are, what you do, and what you want your visitors to do next. Name your pages descriptively but concisely. Go for being clear over being clever. You want Google– and your visitors– to find pages easily. 2. Keep it Short & Simple. Remember– people rarely read websites, they scan them. (Are you still reading this?) Keep page content to a minimum– you can always link to more subpages. Write clearly and simply. Use lots of headings, bulleted lists, and shorter paragraphs to hold interest and get the salient points across. You want your users to find and understand the information they need as quickly as possible. This isn’t a college paper or a legal brief. Imagine you are talking to a client on the phone or over a cup of coffee where you would speak more naturally. There are no points for clever page names or fancy words–if people don’t immediately get it, you’ve lost them. And after that home page paragraph, go easy on the key words. Literally keep these up to date. If there is a date on your site, and it’s an old one, your users will know, and they won’t see a reason to come back any time soon. Be credible and keep your time-sensitive sections fresh and accurate. Even before your site goes live, set up a schedule for what needs to be posted when. If something about a product, service, or aspect of your company changes, update it on the website right away. Every so often read through your site to make sure the content is relevant, and make tweaks here and there so it doesn’t go stale. Before your site is live, assign one person to be in charge of keeping things up to date.